The National Honors Society (NHS) at East Troy High School has been volunteering with the Gathering for over 15 years, and in the words of student Krystal Jacobs, “We have a great experience every time!” East Troy High is one of many high schools that volunteers with the Gathering, but, unlike many other schools, East Troy students travel over 30 miles to make it to the Gathering’s dinner program. The commute may be limiting for many, but for East Troy National Honors Society students—it is a welcome challenge. Jacobs explained that in order to transport 15 students to volunteer, they needed to get their own bus. The NHS students rallied together and fundraised to afford the bus. These fundraisers included creative opportunities such as: Duct Tape A Teacher, where students paid for the opportunity to duct tape their teachers to a wall (an idea they found on Pinterest), selling carnations for Valentine’s Day and doing their own version of eharmony for students. The students successfully raised the money to rent a bus and were able to volunteer on February 22nd. Fifteen NHS members signed up to volunteer. The students cleaned and set up tables, wrapped silverware, prepared food and worked the food line. The NHS members had a great time volunteering. They even adopted nicknames for their fellow students based on what they were serving in line, like Peaches, Cookie, Beans, and Dressing. Like Monte, the Gathering community is also thankful for what East Troy High School and other students do to travel to a meal site and volunteer. We look forward to seeing Peaches, Cookie, Beans, Dressing, Napkins, Coffee, and all other East Troy NHS students when they come volunteer again in March. Who knows, maybe Ed the chef will let us duct tape him to the wall! Jeanne explained this story to me when asked how she first got involved with the Gathering. She is indeed a part of Gathering history, as she has been volunteering for the Gathering’s meal programs for about ten years. Jeanne understands the issues that contribute to hunger and homelessness, having spent plenty of time at the Gathering and in Milwaukee. When sitting down with me, Jeanne discussed the Great Depression, the history of Milwaukee, labor issues, urban sprawl, globalization, deindustrialization and the rust belt, the education system, employment issues and more. For Jeanne, and others involved in the Gathering community, the Gathering offers opportunities to do better. Even opportunities to influence change. Jeanne’s communal view of the Gathering and the work being done is shared by others who volunteer with her at the Gathering’s dinner program. Some dinner volunteers have even tossed around the idea of opening their own restaurant. Jeanne’s ideas, communal vision, education and articulate hope for the future represent one piece of the puzzle that is needed to end hunger and homelessness. Breakfast is served Monday through Friday - St. James' Episcopal Church, 833 W. Wisconsin Avenue. Because 60% to 70% of breakfast guestsare homeless, collaborative mental health, legal, and medical assistance is provided on site weekly. Dinner is served Mondays and Wednesdays at our south side site - Christian Faith Fellowship Church East, 724 S. Layton Blvd. This is our most diverse population with people of all ages and ethnic backgrounds. Saturday lunch is served at the above two locations and at Our Next Generation Neighborhood Center (formerly St. Andrew’s Outreach Center), 35th & Lisbon. Between 25 and 30% of guests are children. Mt. Carmel Lutheran (82nd & Center) serves a Saturday lunch on the fourth Saturday of each month. August 1, 2011 marked the beginning of our Shelter Meal Program (SMP) funded by Community Advocates. 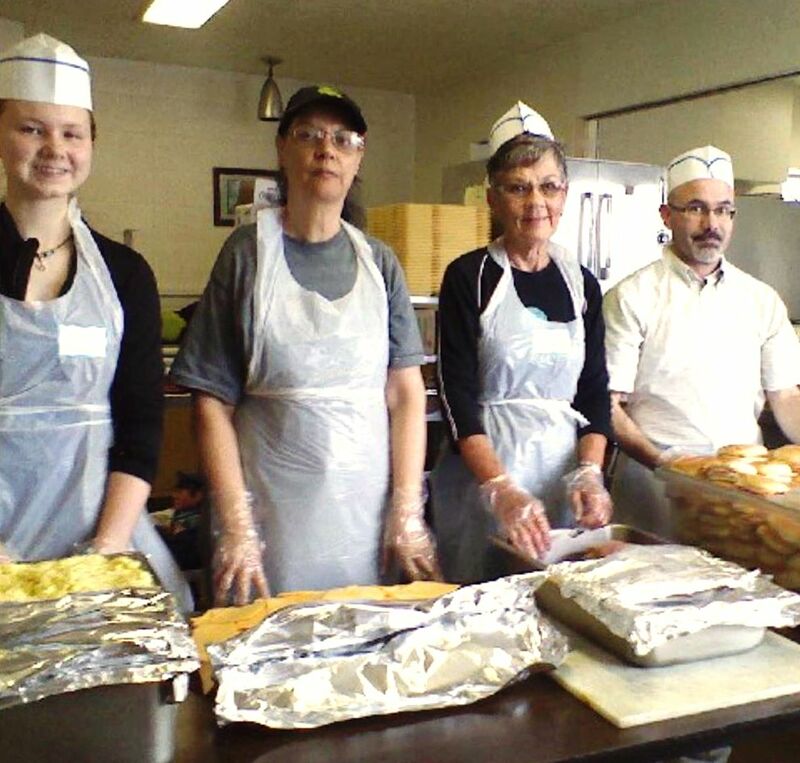 The Gathering prepares all meals on location, seven days a week, for 70-100 residents of the Women’s Refuge homeless and domestic violence shelters, and Autumn West (housing for adult mentally ill). An additional residential shelter housing 12 individuals will be added in late 2012. This program is staffed by 6 part-time employees (4 cooks & 2 drivers), a part-time manager and a nutrition consultant. Community Advocates provides the funding, kitchen and equipment; the Gathering provides the staffing, food and delivery of services. We have developed a volunteer component to the program which is in its fledgling stage. This collaboration is an excellent melding of the strengths of two long standing anti-poverty agencies. This tutoring/mentoring program at 35th & Lisbon - one of our Saturday lunch sites - serves a light meal four afternoons each week to program participants of middle school and high school age. The Gathering provides food for these meals.